Insolvency and Bankruptcy Board of India (IBBI), is a statutory body established in accordance with the Insolvency and Bankruptcy Code, 2016. 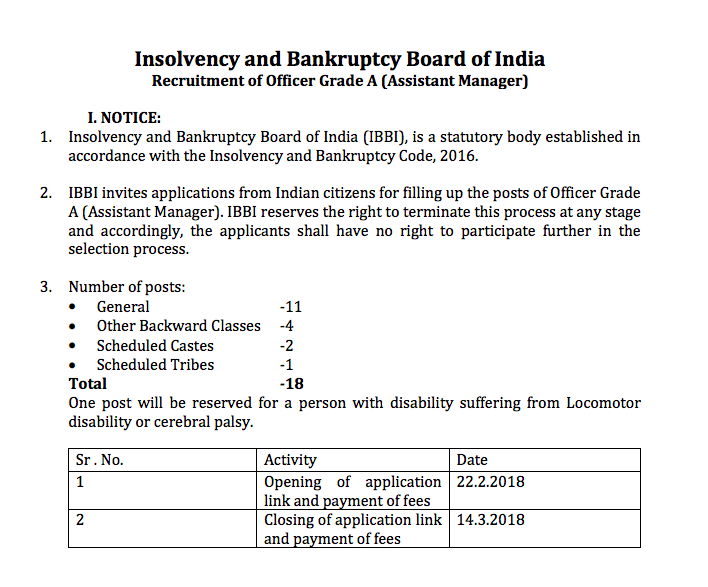 IBBI invites applications from Indian citizens for filling up the posts of Officer Grade A (Assistant Manager). IBBI reserves the right to terminate this process at any stage and accordingly, the applicants shall have no right to participate further in the selection process. Preference: (a) Pass in Limited Insolvency Examination; (b) Higher Qualification than Essential Qualification; (c) Two or more of the essential qualifications; These must be from a Recognised University / Institution. 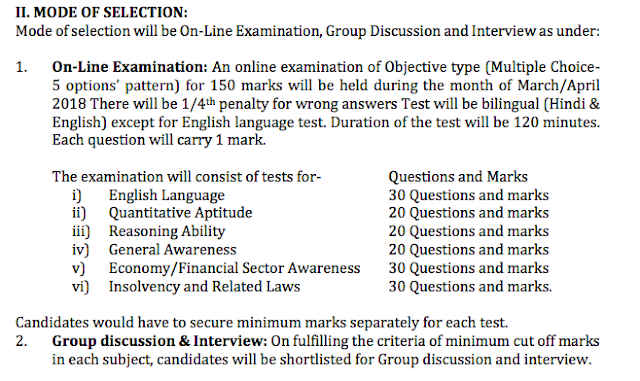 Candidates applying would be expected to be computer literate and conversant with MS Office, Word and Excel Applications. The incumbent will be on a scale of pay of Officer Grade A in the scale of Rs.28150-1550(4)-34350-1750(7)-46600-EB-1750(4)-53600-2000(1)-55600(17 years).